Cricket is a very famous & widely played game so much so that it’s the 2nd most popular game in the World. And Bowling is a Crucial Part of the Cricket. There have been many skillful fast bowlers in the history of Cricket, who made their names by their great bowling skills. Here we are going to make the list of top 10 Greatest Fast Bowlers of all time. Sydney Barnes is an English fast medium bowler. He is regarded as the greatest fast bowler of all time in the history of the cricket. Sydney Barnes made his debut in the match against Australia on 13th December 1901. Barnes played 27 test matches for England from 1901 to 1914. He took 189 wickets with a very impressive average of 16.43, which is the biggest Argument of his greatness. Sydney Barnes also took 719 wickets in his first-class career with an average of 17.09 runs per wicket. Undoubtedly, he was one of the Greatest Fast Bowlers ever in cricket history. A classical side-on action, who played for Yorkshire in county cricket. Fred Trueman represented England for 67 test matches. Trueman was the first ever bowler in the history of test cricket who reached 300 wickets milestone. He remained highest wickets taker for 13 years. Overall he took 307 wickets with an average of 21.57. He recorded his best bowling figures i.e. 8/31 against Australia. The “Sultan of Swing”, Wasim Akram was also regarded as one of the Greatest Fast Bowlers (left arm) ever in the history of cricket. He also has a reputation for being an all time best fast bowler in the history of one day cricket. Wasim Akram was the bowler who could swing the ball both win the air and both sides of the pitch too. He was the first bowler to reach 300, 400 and 500 ODIs wickets. Wasim took 502 wickets in his ODIs career and 414 wickets in test career. Wasim has a record of having over 900 international wickets. Dennis Lillee broke Lance Gibbs’ World record of taking the most number of wickets in the test career (309). He ended up with 355 wickets in 70 test matches. Lillee was a very Dangerous bowler with combination of speed and movement of the pitch and in the air. Lillee also took 113 wickets in ODI career with an average of 20.82. Unlike other fast bowlers, Sir Richard Hadlee was very cool and calm character on the field. But his fast bowling has never been calm. He was the one who gave a huge boost to cricket New Zealand. Richard Hadlee was one of the greatest fast bowlers New Zealand ever produced. Sir Richard Hadlee also was one of the Greatest All-Rounders in cricket history. He took 431 test wickets in 86 matches, with an average of 22.29 and aslo took 158 ODI wickets in 115 matches. With the height of 5’11”, Marshall was not very tall like other west indians. He was one of most dangerous swing bowler. His bowling action was his trade mark. Malcolm was a lot quicker than he looked. He took 376 test wickets in 81 matches and 157 ODI wickets in 136 matches. He has a bowling average of 20.94 in test matches. One of the tallest bowlers of all time, McGrath was the hunter of “biggest fishes” like Bian Lara and Atherton. In our opinion, McGrath was the all time best fast bowler in terms of “using the no Ball”. With spot-on line and length, McGrath took 563 test wickets in 124 matches. He was the 1st fast bowler to play 100 test matches. McGrath also took 381 ODI wickets in 250 matches. He has the best bowling figure of 8/24. Curtly Ambrose is one of the tallest cricketers of all time. Ambrose was 6ft 7in and he could release the ball from almost 10ft high. With a lethal pace, bounce, and swing, he was one of the most dangerous fast bowlers. He took 7 wickets for only 1 run against Australia at WACA 1992/93 season. That was one of the best bowling figures of all time. Curtly Ambrose took 405 test wickets in 98 matches, with an average of 20.99. and also 225 ODI wickets in 176 matches. Without any doubt, he is one of the Best Fast Bowler of all time. Out of all the bowlers that we mentioned today, Dale Steyn is the only one currently playing cricket. Cricinfo says about Steyn: “Dale Steyn could be just the latest nuclear-tipped arrow that South Africa have drawn from their seemingly bottomless quiver of classy fast bowlers. The trouble, for opposing batsmen, is that he is rather more than that”. He took 350 test wickets in just 69 matches and took 123 wickets in 79 one day matches, and he is still going. Maybe he will get to the top after completion of his career. 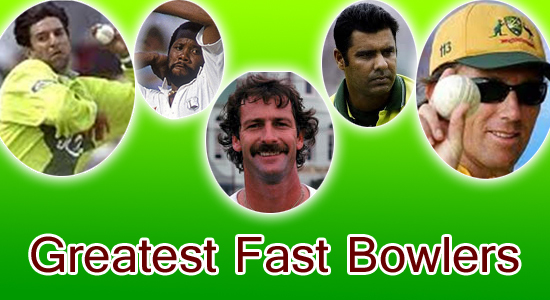 So these were the top 10 Greatest Fast Bowlers of all time. Feel free to share your opinion in the comments down below.